Enjoy a multisensory experience through our treatments at our massage center in Barcelona. Our relaxation and beauty treatments for body and mind will take you to a state of Slow Beauty. Select facial and body treatments, complete rituals or romantic experiences to enjoy as a couple, without forgetting the best massages in Barcelona. You will also find in Slow Spa treatments for pregnant women. In the gestation stages, where your care is essential, there is nothing better than a relaxing and relieving prenatal massage. All this done in a very special space and exclusively with a selection of the best 100% natural, organic and vegan products. Because in Slow Spa we are committed to the planet, and because nature offers us the best organic assets, our products are free of parabens, sulfates, ethylene derivatives and mineral oils, and none of them has been tested or made with animals. Our massage center in Barcelona born from the desire to create a place of wellness and relaxation, a peaceful oasis in the middle of the big city. 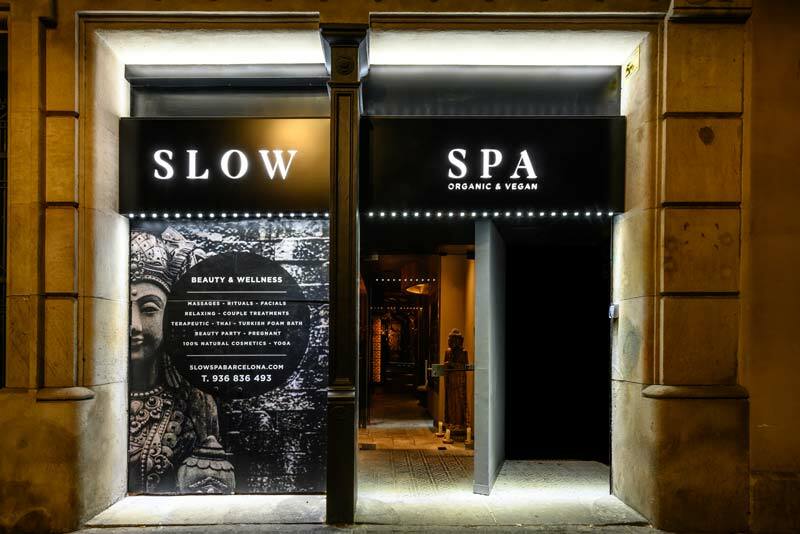 SLOW SPA is a new wellness space inspired by Asia, cozy and comfortable, located in the heart of Barcelona’s Eixample. Currently in the urban environment we live with the rapidity of day to day, immersed in a frenetic and constant rhythm that often leads us to stress and anxiety. The day passes like on board a train that does not stop at any station, it just runs. Well, we have created a space where we stop time, and relaxation and tranquility are guaranteed. When you enter Slow Spa, the rhythm changes. It is easy to forget the haste and problems and relax completely. In Slow Spa we bet to take the necessary time to enjoy the treatment and understand that, in addition to the aesthetic benefits, it also provides others that help to combat stress. In Slow Spa we offer you a space to stop and enjoy time for you, a space where you can relax with the best treatments and massages in Barcelona. Our massage rooms have an exclusive decoration inspired by Southeast Asia, and are equipped with every comfort, offering an exclusive and private wellness space. All the products that are applied in the treatments of our massage center are 100% natural, organic and vegan. We exclusively use products formulated with organic active principles of maximum purity and efficiency, which do not include ingredients or derivatives of animal origin in their composition. Our treatments are adapted to the needs of each client through an exclusive and personalized attention, and are carried out in a unique environment. We have a wide variety of wellness offers to help you renew and recharge. Enjoy a refreshing massage, or any of our rituals, body or facial treatments, and start your wellness journey by healing your body, mind and soul in a relaxing environment inspired by Southeast Asia. It is widely known that massage provides benefits for physical health, but it is not so much that it also has multiple benefits on a mental and emotional level. The contributions of a good massage to our well-being are innumerable: from the corporal and mental relaxation to the generation of endorphins that contribute well-being, through the improvement of the immunological system, the improvement of the circulation or the relief of pains. Reserve your moments of wellness and beauty in Slow Spa and discover all the treatments we have prepared for you in the best massage center in Barcelona.